Nouvelle, Inc. reports unprecedented 1st and 2nd quarter sales of high-end post-surgical compression wear products, coinciding with recent statistics indicating a surge in plastic surgery numbers. We are very diligent in ensuring our stock reflects the upward trend in cosmetic surgical procedures. Nouvelle, Inc. is pleased to report an overall surge in 1st and 2nd quarter sales of its high-end compression wear products, mirroring recent statistics released by the American Society of Plastic Surgeons (ASPS) indicating increases in plastic surgery procedures. “While national sales are holding steady with moderate increases, it is interesting to note that some of our largest orders since January have been from international medical supply distributors,” said Dawn Cover, president of Nouvelle, Inc.
1st Stage Healing Garment: Worn immediately post-op and up to six weeks following surgery. Generally, garments used during this period are designed for ultimate ease-of-use with maximum compression levels, convenient zippers and safe closures. 2nd Stage Healing Garment: Phased in at four to six weeks after surgery. Garments worn at this stage use slightly less-constrictive fabric and no zippers. Each pull-on design is lightweight, easy to wear, and designed to enhance the smooth lines of a patient’s newly transformed physique. Common procedures for which 1st and 2nd stage compression sets are purchased include tummy tuck (abdominoplasty), hernia operations, and a variety of liposuction procedures: hip liposuction, thigh liposuction, stomach liposuction, flank liposuction, buttock liposuction, upper thigh liposuction, lipoplasty, suction lipectomy and liposculpture. The men’s abdominal supporter offers safe, supportive comfort for the abdomen and groin. Unique features include five flexible cotton/nylon panels for precise body contouring, adjustable hook-and-eye closures, and the softest fabric weave available on the market to ensure complete, healing comfort. The men’s abdominal provides excellent support for hernias, groin pulls, male liposuction, male abdominoplasty (tummy tuck), lipoplasty, suction lipectomy, liposculpture, smartlipo, vaser liposuction, laser liposuction, and gastric bypass. 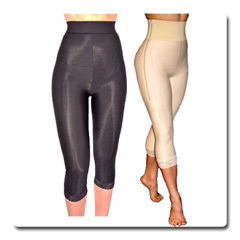 Nouvelle manufactures and distributes post-surgical compression wear, body shaping garments, and scar care products worldwide from its facility in Virginia Beach, Va. Its internationally-recognized products are available through approved distributors and online at http://www.nouvelleinc.com. The company recently expanded its business and distributor base thanks to emerging markets throughout Europe and beyond. It is currently in the process of searching for even more distributors of its highly-regarded, handcrafted products. For more information about purchasing or distributing the company’s products, please contact Dawn Cover via email or telephone. Nouvelle hand-inspects each seam and stitch to ensure garments are soundly, solidly constructed. New compression sets are cost effective and convenient. New men's abdominal supporter: safe, supportive comfort for the abdomen and groin. Press Release: Heightened Product Production Most compression garments are available in beige and black, and many feature elegant lace details. The bodysuit: a best-seller and one of Nouvelle, Inc.'s signature products. Nouvelle maintains a meticulous approach to ensuring every stich, every panel, and every aspect of each garment is sturdy, comfortable, and durable.